This week, I planned on finishing the feont of Little Man's sweater. But I got distracted. My car died on Thursday night and I sat waiting for my hubby to pick me up for about an hour. I packed some yarn I received at Christmas with a needle and pattern, and I was glad I did. 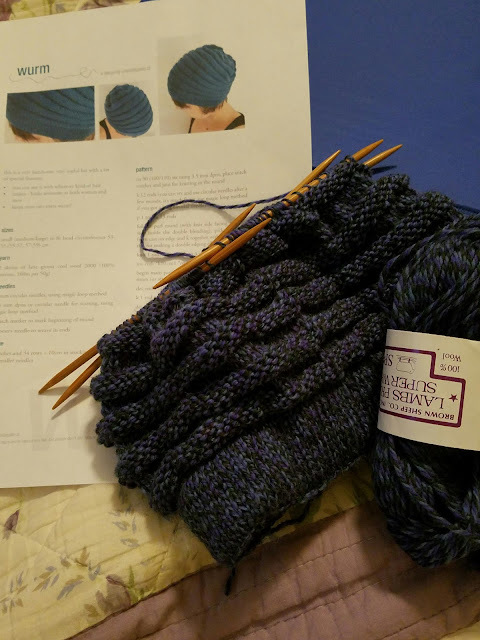 I managed to start my Wurm hat, and it has been addictive ever since. Also, the weather turned super cold (we had a bit of snow), and I kind of have been wanting another hat. I am close to being done on the sweater front, but the hat is easiser to pull out and work on. Ever get distracted like that?